Hydrostatic skeletons: Found in creatures such as worms and jellies, hydrostatic skeletons are basically chambers filled with water. Animals with this skeleton type move and change their shape by squeezing their water-filled chambers — just like what happens when you squeeze a water balloon. Exoskeletons: These are exactly what they sound like — skeletons on the outside of the body. You’re probably quite familiar with these hard exterior coverings because they’re found on crabs, lobsters, and many insects. Exoskeletons are rigid and can’t expand as animals grow, so animals must molt, or shed, their exoskeletons periodically. After an animal molts, its new exoskeleton is soft — as in a soft-shelled crab. Endoskeletons: The most familiar of all skeleton types is the endoskeleton. After all, it’s the kind of skeleton you have. An endoskeleton exists within an animal’s body. The human endoskeleton is hard because it’s partially constructed of the mineral calcium. The endoskeletons of other animals may be more flexible — for example, the endoskeleton of a shark is made of cartilage, the same material that makes up the soft parts of your nose. Animals with hydrostatic skeletons and exoskeletons are considered invertebrates, meaning they don’t have a backbone. Animals with endoskeletons, like you, are considered vertebrates because they have a backbone. All vertebrate skeletons— whether they belong to humans, snakes, bats, or whales — developed from the same ancestral skeleton (which explains why you may notice similarities between your skeleton and that of your pet dog or cat). Today, these animals show their relationship to each other in part due to homologous structures — structures that are equivalent to each other in their origin. 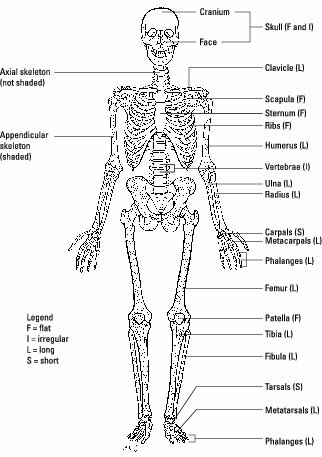 The axial skeleton: This part supports the central column, or axis, of the animal. The axial skeleton includes the skull, the backbone (also called the vertebral column), and the rib cage. The skull protects the brain, the backbone protects the spine, and the rib cage protects the lungs and heart. The appendicular skeleton: This part extends from the axial skeleton out into the arms and legs (which are also known as appendages). It includes the shoulders, pelvis, and bones of the arms and legs. In some vertebrates, such as snakes, the appendicular skeleton has become extremely reduced or nonexistent. If you’ve ever watched an old Western movie, you’ve probably seen images of bones bleached white by the Sun and scattered alongside a pioneer trail. The dry white bones of these images are very different from the living bones that are in your body right now. Bone is actually a moist, living tissue that contains different layers and cell types. Fibrous connective tissue covers the exterior of bones and helps heal breaks in an injured bone by forming new bone. Bone cells, which are embedded in a bone matrix, give cells their hard nature. The cells actually make the matrix, which consists of collagen that has been hardened by the attachment of calcium and phosphate crystals. Cartilage covers the ends of bones and protects them from damage as they rub against each other. Spongy bone tissues are filled with little spaces, similar to those you see in volcanic rocks. These holes are filled with red bone marrow, which is the tissue that produces your blood cells. Compact bone tissues are hard and dense. A cavity within compact bone is filled with yellow bone marrow, which is mostly stored fat. If the body suddenly loses a large amount of blood, it converts the yellow bone marrow to red bone marrow so that blood cell production can be increased. Joints are structures where two bones are attached so that bones can move relative to each other. Bones are held together at joints by ligaments, which are strong, fibrous, connective tissues. Ball and socket joints consist of one bone, with a rounded, ball-like end, that fits into another bone, which has a smooth, dishlike surface. Your arms and legs fit into your skeleton with ball and socket joints, which is why you’re able to rotate your arms and legs in all directions. Pivot joints allow you to swivel a bone. When you rotate your arm so that your palm faces up, then down, then up again, you’re using a pivot joint. Hinge joints allow you to bring two bones close together or move them farther apart, much like you open and close a book. Your elbows and knees have pivot joints that allow you to extend and contract your arms and legs.